This morning I was speaking with my adult son over coffee, and for some reason, the subject of bats came up. We were talking about how beneficial they are in nature. For instance, did you know the Little Brown Bat can devour between 500-1000 mosquitoes an hour? Wowsers! No wonder some people have bat houses in their yards where I live. The vampire bat is a bat of a different color, so to speak. These creatures feed off blood. They mainly feed off the blood of livestock, but yes, they will consume human blood too. Lovely creatures. According to an article by National Geographic: “In one year, a 100-bat colony can drink the blood of 25 cows.” [read full article]. 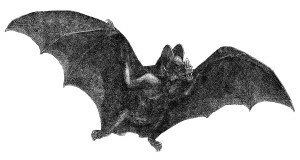 While the movies may portray the vampire bat as a menacing, bloodsucking, creature, they would be mostly incorrect. Vampire bats are the only mammals on earth that feed entirely on blood. The baby bats don’t feed on blood, but from the milk of their mothers. The vampire bat’s teeth are so sharp and precise, that most will fail to notice the bite at all. Heat sensors in its nose will guide it to the best spot to bite its prey. The bats will go on the hunt during the darkest part of the night. They mostly feed off of cattle. Due to their abundance and size, they become an easy mark. The bats will feed on their prey for about 30 minutes. They don’t consume enough to harm their victim. These bites, however, can bring on infection and disease. Vampire bats are usually found in South, and Central America, and Mexico in tropical zones. They are approximately 3.5″ long, with a 7″ wingspan. Hardly as huge as they seem in your run-of-the-mill vampire movie. Yes, these creatures of the night are extremely fascinating, and I urge you to learn more about them. They are part of our wondrous existence that we share on this planet, and deserve to be respected for what they are. If you enjoyed this article about vampire bats, Please Like Or Share Below!